The new watches for 2011 are the fruit of a studied stylistic redefinition of the brand. They are the perfect embodiment of its resolutely modern and sophisticated identity, which is founded on a subtle balance between style and technical performance. TUDOR has become an icon of retro chic style, a seductive expression of form and function rooted in supreme reliability. This year, TUDOR again pays homage to its unique values and its six decade heritage by launching an updated version of the TUDOR HERITAGE ADVISOR model, one of the brand’s emblematic pieces. 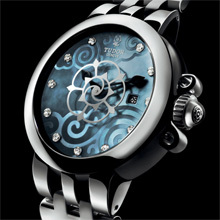 TUDOR combines refinement and extreme attention to detail in a totally feminine timepiece. The new TUDOR Clair de Rose line is a hymn to feminine beauty. As its name suggests, it takes its inspiration from a world of reverie and moonlit nights and transports us into a unique delicate and sophisticated universe. 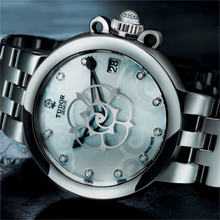 The centre seconds hand in the form of a cut-out TUDOR rose lends captivating and infinite charm to the timepiece. Roundness and softness come to mind to define its cushion-shaped case, its curving silhouette and domed sapphire crystal. The looped decorations harmoniously enveloping the winding crown are a subtle detail of jewellery design. The crown is topped with a transparent dome containing a rose, the logo of the TUDOR brand in the 1950s. Softness also characterizes the cloud-inspired, stylized scroll motif on the motherof-pearl dial, applied using an elaborate procedure ; the rounded cut-out hands add yet another hint of softness. In the gem-set version, the central rose evokes a full moon in a starry sky. The fabric strap features the same scroll motif on a satin background, an extra touch of refinement. The triple fitting attaching the bracelet to the case adds a mechanical aspect and creates an unexpected contrast that enhances the piece. The new TUDOR Clair de Rose comes in three sizes with a 26 mm, 30 mm or 34 mm case. Available in steel or in steel and 18 ct pink gold, this model comes with a vintage steel bracelet, a reinterpretation of the “rice grain” bracelets of the 1950s, or a satin or fabric strap. 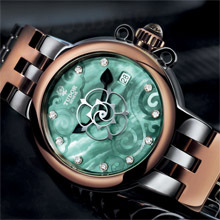 The mother-of-pearl dial, with or without gem-setting, is available in Sky, White, Jade or Tahiti Pearl.